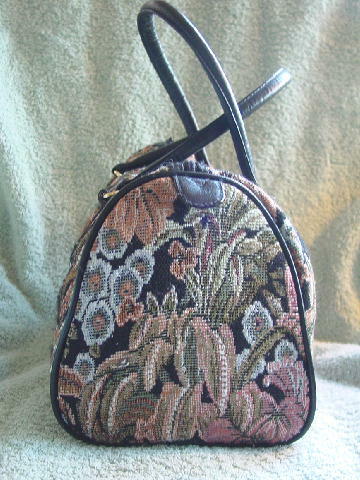 This vintage tapestry handbag has a top side to side zipper closure and two padded 15 1/2" long faux leather black handles. It has a faux leather exterior bottom and the interior has a black plastic lining with a piece of cardboard (it's not attached to anything) which is covered in the faux leather. The handbag is light in weight. 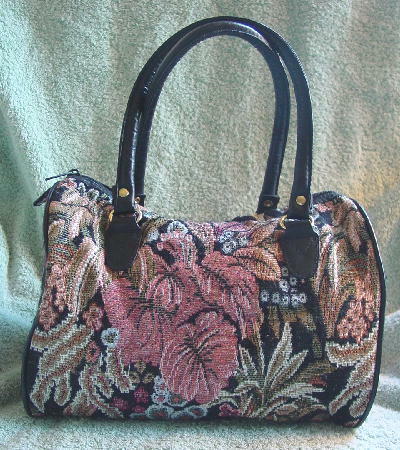 The tapestry has a floral pattern in pinks, blue, peach, black, and greens. The black color is wearing off the handles where you hold them.